Photo courtesy of Chas Mannell. 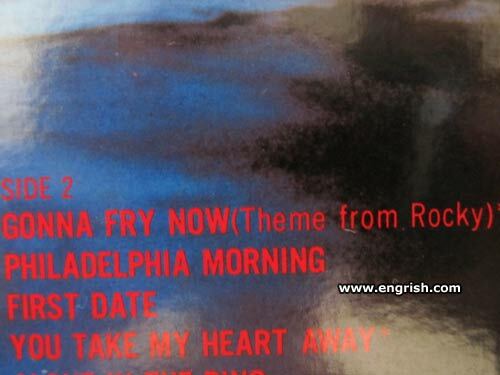 Found on “Best of Rocky” LP released in Japan. From the alternate version of Rocky where he is training to be a chef. I’ve still got my first date. In fact it’s there only one I’ve ever had. Didn’t Rocky train by punching meat carcasses? Is “The Vinyl Countdown” on there? Don’t worry about your heart mate, you can have it fried with eggs for brekkie. You Fry and Filetdelphia Mourning. Yu No Hoo: Yes, but Rocky did not cook them by punching them over and over. Why do people pan this album? Anyone can make a missteak. @Huu Yuu.0407. Energy cannot be created or destroyed, It can only be change from one for into another. Thus: The Kinetic energy from his fists would be turned into heat. Therefore, if he punched them fast enough, and often enough, it is theoretically possible that enough heat energy would be transmitted, to cook the side of beef. And all of your favorite Kinki kids songs! (Theme from Locky.) Warning: Do not play this on your computer. Rocky got religion, gave up boxing and decided to serve the Lard. They slipped in one from “The Green Mile”. Rocky will face his toughest opponent yet, Chef Gordon Ramsey! Gonna fry some good rocky softened flank now, a nice philly cheese steak in the morning, and with our first date, I’ll already have taken your “heart” away. With one too many hits to the head, Rocky finally snapped and went on a killing spree. He was caught and convicted….